Jim Farrish is the Founder and Editor of SectorExchange.com and TheETFexchange.com. His primary goal is to educate people about investing. He has taught workshops locally and nationally for over 25 years, teaching thousands of individuals, business owners, and advisors how to focus on achieving financial independence. 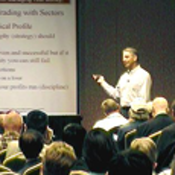 Jim speaks at The World Money Shows in Las Vegas, San Francisco, and Orlando annually. He also speaks at Advisor Symposiums throughout the country. From these years of experience, Jim has developed web-based investment services and publications for use by self-directed investors and investment professionals. Both of his websites, SectorExchange.com and TheETFexchange.com are updated daily with market scan, watch, and play lists, as well as, daily updates written by Jim. His extensive research is drilled down daily into a comprehendible format for use by subscribers to these sites. Have Investors Gotten Too Optimistic Too Quickly? Retail Ready to Move Higher? Is Inflation Really Too Low? Transports in the Breakdown Lane or Stalled? Is the Selling Over for Gold? Are Energy ETFs the Right Fuel for Your Portfolio? In a Rising Rate Environment, Can You Still Generate Dividend Income? Is China Ready to Move Higher?